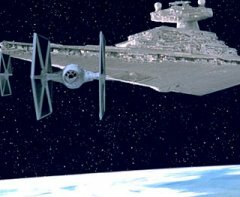 The Imperial I-class Star Destroyer, originally known as the Imperator-class until after the Great Jedi Purge, was a monumental class of warships designed by Lira Wessex and built by Kuat Drive Yards. They were massive, powerful warships capable of laying waste to entire worlds (provided those worlds did not have planetary shields). The Imperial-class became infamous as the prime enforcer of Imperial rule. It belonged to the Star Destroyer family of warship, examplified by its dagger/arrowhead design. A single Imperial-class vessel cost the Empire at least 3.88 billion Imperial credits�the equivalent of several star systems' annual economic output. The successor to the design philosophies of the Venator and the Victory class star destroyers of the Clone Wars, the Imperial was a presence sufficient enough to quell potential rebellions simply by their arrival in system.